When I reviewed a trio of gas station finders for the iPhone and IPod touch, I included an application called iGas, which I didn’t find terribly impressive. While version 1.1 did offer the best pricing information, it couldn’t display the distance to stations, wouldn’t let you sort by closest station (for those times when you need gas now) and that it crashed quite often. Something I didn’t note in my article was that the driving directions didn’t work very well, either, as they didn’t use the iPhone’s built-in Google Maps feature. But iGas has since undergone some changes, including one to its name. It’s now called iGasUp, and version 1.11 of the program fixes all of the problems outlined above. iGasUp now shows the distance to each station in its standard station list, and a button lets you easily sort the list by either closest or cheapest. The overview map, which shows all the located stations, is still somewhat slow to load and scroll, but driving directions are now much better—when you ask for driving directions to a given station, iGasUp switches over to the iPhone’s Maps program, with directions loaded from your current location to the chosen station. Once you’re in the iPhone’s Maps program, you can use all of its tools to help you get from your current location to the gas station. The built-in map works well for an overview, but that’s about it. It’s still slow to load, you can’t get driving directions directly from this map, and tasks like dragging and zooming the map are slow and jerky. Luckily, you don’t really need to use the built-in map for much other than a general sense of where the listed stations are located relative to your current position—which is now shown on the built-in map, unlike in version 1.1. The overview map still seems a bit buggy, too—I had it crash on me a couple of times while dragging and zooming. When you tap an entry in the station list, you’ll see a summary page showing that station’s address, a driving directions button, and pricing information (including date and time of last update) for that station’s available grades of gas. The up-to-date pricing information is iGasUp’s key advantage over its competitors. The pricing information is provided by Oil Price Information Service (OPIS), which gets its information from credit card transactions. As I was testing the program, the oldest pricing data I found was about 48 hours old; most prices were no more than 24 hours old, and quite a few had been updated within the last 60 minutes. In this time of volatile prices, this sort of information can save you real money. As an example, I found that two stations within five miles of my home have a price difference of nearly a quarter a gallon—or about $3.50 per fill up in my car, which is 50 cents more than it costs to license iGasUp for a year. Yes, licensed—iGasUp isn’t sold or given away, like many of the other gas station finders. I assume because of their use of the Oil Price Information Service, iGasUp is licensed on an annual basis. For $3, you can use the program for a full 12 months, after which time you’ll need to relicense it. Given we’re not there yet, it’s hard to say how hard or easy this relicensing step will be. However, if you take advantage of the gas savings the program can find, saving $3 is trivial, as seen in my previous example. iGasUp’s preferences let you specify a preferred grade of gasoline; what you set here determines the price you’ll see in the results list. You can also specify a search radius in square miles, and whether you want the default list view to be sorted by closest or cheapest. iGasUp’s coverage seems to be excellent for the major chains and retail-outlet-located stations, such as those at Safeway. 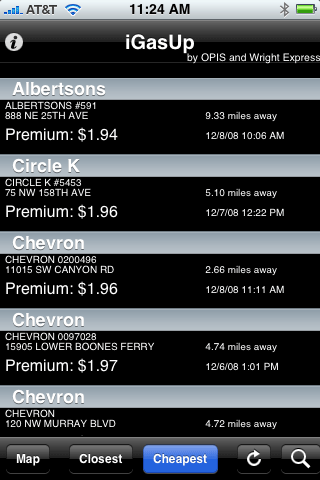 It didn’t, however, find any of the Arco stations in my area, which are relatively common. I also didn’t see any independent stations in the results, though those are getting rarer and rarer by the day. Unlike its end-user-based competitors, you won’t be able to add such stations to the iGasUp database; if a station doesn’t participate in OPIS, you won’t see it in the results listing. This latest version of iGasUp addresses all my complaints with the previous version, save the occasional crash in map view. If you can live with a (relatively cheap) annual fee and potentially not finding every single station in your area, iGasUp offers the most accurate and up-to-date pricing information of any of the gas station finders I’ve tested. While it will never have the breadth in coverage you’ll see in the programs with end-user-created databases, there’s something to be said for accurate and timely information on gas prices. For that reason alone, iGasUp now has a permanent home on my iPhone’s screen. iGasUp is compatible with any iPhone or iPod touch running the iPhone 2.x software update.